I’ve had a lot of people ask me to share the experience we had with our four year old having a tonsillectomy and adenoidectomy. I’m going to be as detailed as possible– sharing the lead up to the surgery, preparing him for the surgery, surgery, and recovery. Our road to Owen having the tonsillectomy and adenoidectomy was long, stressful, and somewhat traumatic. In short, he had three ear infections within 3 months. Whenever he would catch a cold, his tonsils would swell up (bigger than they already were) and block his eustachian tube, resulting in an ear infection. The swollen tonsils were also causing him to have sleep apnea. We saw the first ENT last June after Owen had strep, an ear infection, and kissing tonsils (the tonsils touch) in May. I had recorded a video of Owen sleeping where he was pulling air in through his mouth, head cocked back, and showed it to the ENT. The ENT didn’t seem concerned, but he said if we really wanted to know if Owen had sleep apnea, he needed a sleep study. 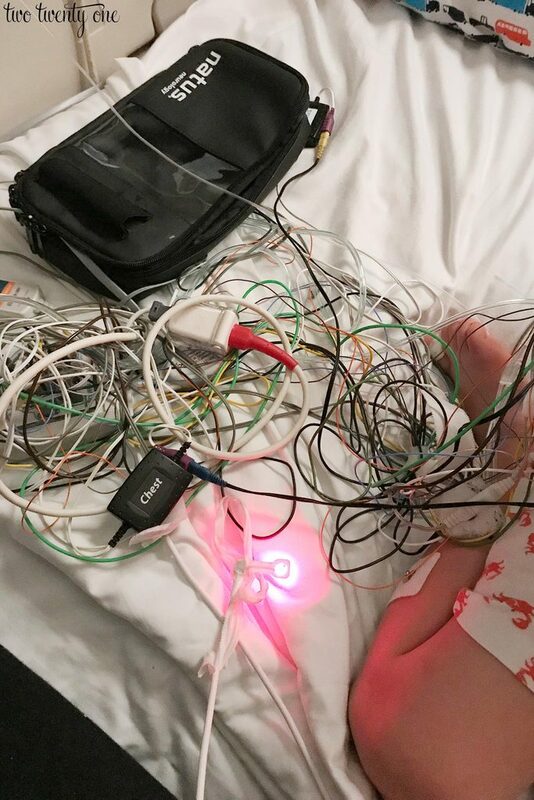 We scheduled a sleep study, which took place in mid-July at one of the local children’s hospitals. It was hands down the most traumatic thing Owen and I have gone through. I had no idea he would need so many things hooked up to his head and body. The hospital prep video really tones things down. I also didn’t know it would take 45-60 minutes to put all the electrodes and other things on his body. To make matters worse, during one of Owen’s meltdowns, because he was exhausted (the study didn’t start until 10PM and they told me not to let him nap) and incredibly scared, one of the techs grabbed Owen by the chin and shouted, “Young man, you nee to calm down!” in his face. Long story, short, I packed up our things and we left the sleep study at 12:30 AM. I called the sleep study supervisor the next day to report the tech’s inappropriate behavior and praise the other tech who was very kind and understanding. We saw another ENT a couple weeks later in late July. I was afraid Owen would still have some residual trauma from the sleep study, but lots of people raved about this ENT and his bedside manner with kids. We were in a tiny exam room with Owen, Emmett (in the stroller so he could be contained), me, the ENT, his assistant, and an intern. Owen didn’t want to be examined and had backed himself into a corner in the room. The ENT started to seem annoyed it was taking a couple minutes for me to coax Owen out of the corner. I was finally able to get Owen to leave the corner when the ENT suddenly grabbed Owen, picked him up, and placed him in my lap so he could examine him. All of this happened so fast that I could barely process it, but I knew I didn’t like him grabbing and picking up my kid. After quickly examining him, the ENT said he could remove the tonsils and adenoids. I didn’t even have time to show him the videos of Owen sleeping. The whole thing felt extremely rushed, especially when we were talking about surgery on a three year old. I just got this icky feeling about the whole thing. I even called Brad afterward and told him it felt like an insurance money grab situation– it’s like the ENT was treating it like mole removal and not a tonsillectomy. Brad said that if I didn’t feel 100% comfortable with that ENT then we wouldn’t go with him. And we didn’t. After those two negative encounters with medical professionals, I decided that we needed to take a little break. When Owen had his third ear infection (and went on his third round of antibiotics) in mid-August, it spurred me to start looking for another ENT. I researched more ENTs in our area and landed on a pediatric ENT who received glowing reviews from many moms. So I called and made an appointment with this ENT for October 1st. Tip: One of the ways I find things like doctors, cake bakers, etc., is by searching through local moms groups. I just type in “ENT” in the search bar of the group and go through previously asked questions and answers. I do this for all kinds of stuff. For our third ENT consultation, I asked Brad to take off work and go with us because I couldn’t mentally do it any more by myself due to our track record. So the four of us met with the ENT on October 1st. We prepped Owen the days leading up to the appointment, telling him the doctor was going to look in his ears, nose, and mouth. The ENT was wonderful. Owen didn’t want to be examined so she put on her head gear and was able to take a look at Owen without getting very close. Her bedside manner was great with him. She asked us questions about Owen, we asked her questions. I showed her some videos of him sleeping. And instead of brushing me off like the first ENT did, she said it appeared he had moderate to severe sleep apnea– he was tilting his head back in his sleep to open his airway, snoring, and he was using his chest muscles and diaphragm to open his airway and pull air into his lungs. Tip: If you’re concerned that your child has sleep apnea, take a few videos of him/her sleeping. Make sure you capture their head and chest. After talking with the ENT at length, we decided to schedule the surgery for November 1st. We left the visit feeling completely comfortable with allowing her to operate on Owen. Call it mom gut, but everything just felt right. 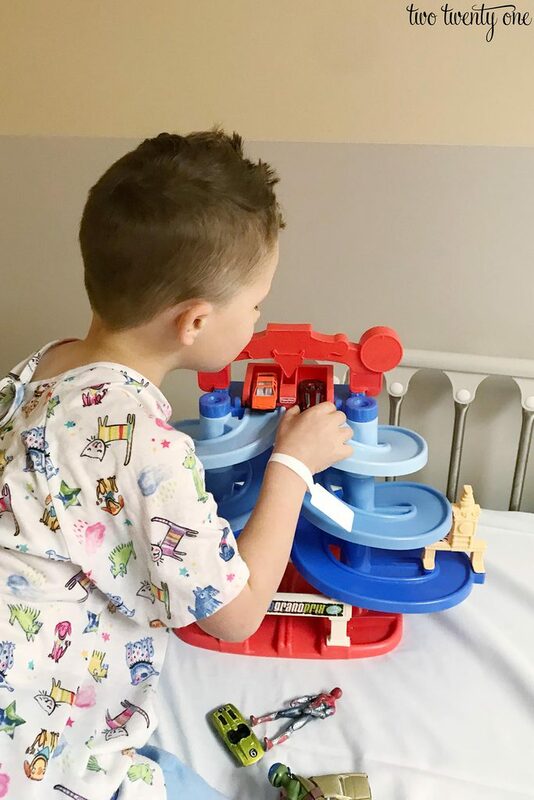 We had no idea how to prepare Owen for his tonsillectomy and adenoidectomy, so I did what I usually do when I need advice– I got on Instagram and asked for help. So many of you replied to me and offered really great advice. Thank you so much! I know I can always count on you guys to help me out. One of my college sorority sisters, who’s a child life specialist, saw my post and messaged me. 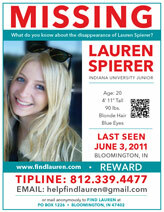 I didn’t know this, but she said she was living in Indianapolis and, coincidentally, working as a child life specialist at the children’s hospital where Owen’s surgery would take place. She offered to call me and give me some advice. I can’t thank her enough for taking the time to give me some suggestions on what to say to Owen. After talking with her, Brad and I came up with our game plan. Owen is the type of kid who will over-think things if you give him too much information so we decided to be as general as possible. 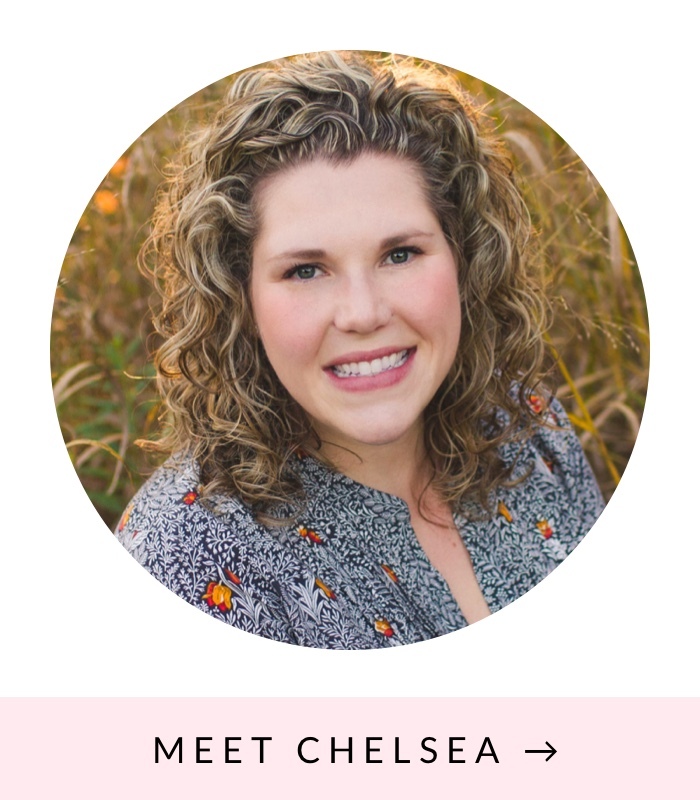 If you don’t have a child life specialist in your life and are still feeling apprehensive after reading this blog post, I suggest calling your child’s hospital and asking to speak with a child life specialist. I know many hospitals also offer tours to make children more comfortable and prepared for their upcoming surgery. I don’t think a tour beforehand would’ve been beneficial for Owen and his personality, but it may be good for other children who need a lot of information. We started talking to Owen about the surgery two nights before the surgery. We didn’t want to start talking about it too far in advance because he’s the type of kid who will fixate on it and make himself anxious. The first night, we told him we were going to the doctor the day after tomorrow so the doctor could make his throat feel better. We left it at that. Very basic. He did seem somewhat uneasy when we said he would be going to a kid-only room with his hospital friend and Brad and I would have to stay in the mommy and daddy room. But we told him his new friend would take good care of him, and we would wait for him in the mommy and daddy room. We had to go over this a couple times until he felt reassured. On the way to the hospital, we talked a little bit more about things to reassure him. But we kept the language and explanations as basic and general as possible. We never said “surgery”. It was always “The doctor is going to make your throat feel better.” We also talked about how he could have popsicles and ice cream after the doctor made his throat feel better. Our ENT’s policy is if the child lives within one hour of the hospital, they can go home for the night if everything goes well with surgery and recovery. While we hoped we didn’t have to stay the night in the hospital, our ENT said there was a chance and that they’d reserve a bed for Owen just in case. 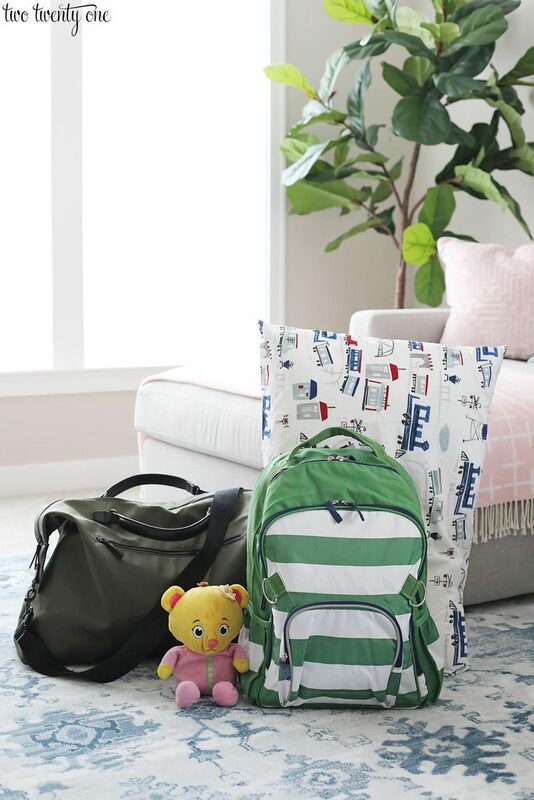 In case Owen had to stay, I packed an overnight bag for him and me. We also brought his pillow, one of his blankets, and his tablet. When we arrived at the hospital, we left the bags and Owen’s pillow in the car. If we needed to stay, Brad would’ve gone out to the car to retrieve them for us. Then, Brad would’ve gone home for the night and returned in the morning to get us. We arrived at the hospital at 8:30 AM. We checked in, and around 9 AM they called us back into the surgery area and put us in a room, where we stayed for the duration of our time at the hospital. Our nurse for the day took Owen’s temperature and blood pressure. Brad and I helped Owen change into his surgery clothes– a shirt, pants, and non-slip socks. Then, his child life specialist stopped by with some toys for Owen to play with while we waited. As we waited, we asked him what flavor of popsicle he wanted later on. And we also asked him how many popsicles he wanted to eat. He said four. I also showed him a picture on my phone of his wrapped present that was waiting for him at home. This gave him something to look forward to. His child life specialist came back a little bit later and had him decorate his mask with stickers and choose what flavor he wanted to scent his mask with (she used chapstick). He chose orange and she let him apply the chapstick inside the mask. Then, she had him put the mask on his face and smell the orange scent. This activity helped the mask seem less scary to him. The anesthesiologist came in for a little bit to ask us some questions and answer any of our questions. Our ENT also stopped by to go over everything with us and answer any of our questions. I half-joked that I cut his finger and toe nails the night before in case he decided to fight someone. At 10 AM, Owen’s child life specialist, nurse, and some other medical people arrived to take Owen back to the ER. 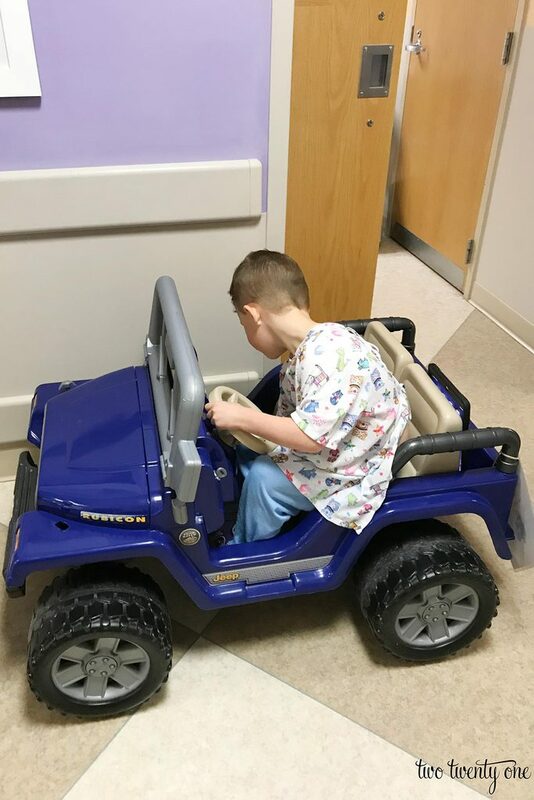 They also had a Power Wheels Jeep waiting for him to drive back to the operating room. We gave him hugs and kisses, said “have fun!” (because he had no idea what was about to happen), and told him we’d see him in a little bit. Then, he drove off with his child life specialist, without showing any signs of being scared or nervous. His child life specialist stopped by the room not even 5 minutes later and said that he was already asleep. She said that he hopped up on the table and put on his mask without incident. We were amazed. I felt so much better knowing that he wasn’t afraid. The surgery took about 35 minutes, and the anesthesiologist and ENT said everything went very well. Our ENT said his tonsils were a size 3+ (4 is the largest size). She went over the aftercare instructions with us and gave us a handout to take home. Owen was wheeled back in the room with us around 11:40 AM after spending some time in the recovery area waking up. He was pretty docile when they rolled him into the room. The nurse asked him what kind of popsicle he wanted and brought it to him. For the next three hours, he proceeded to eat four popsicles, one jell-o cup, one applesauce, and one ice cream cup. The nurse said she’d never seen a tonsillectomy and adenoidectomy patient eat as much as him, which was a compliment. He watched TV and played on his tablet while he laid in bed. Around 2:30 PM, the nurse said we could get ready to go home. We changed Owen into the clothes he wore to the hospital, gathered our things, and headed home. Our ENT told us to plan for Owen to be out of preschool for at least a week. His surgery was on a Thursday, and we didn’t send him back to school until the second Monday after– 11 days later. She told us the main goal was to keep him from catching an illness and to keep him relatively calm. He could play, but no running, jumping, or playground-type play for at least 2 weeks. Owen spent a lot of time playing around the house by himself and with us, watching movies, doing crafts, and playing on his tablet. The day after surgery, we made him take a nap because he was fading fast once the afternoon hit (he doesn’t take naps anymore). The nap really seemed to help, although it was a battle to get him to lay down. Our ENT warned us that days 3-5 are the worst, and we found that to be true. Owen would get frustrated that his throat hurt. We’d try to distract him and help with the pain by giving him a popsicle or a slushie. It also helped having our parents here in the first few days after the surgery. My parents came the day before surgery and stayed for a few days, and then Brad’s parents came for a couple days. Owen slept with a humidifier every night for two weeks. This helped to keep his throat and nasal passages from drying out overnight. His voice did sound funny for a couple weeks following the surgery, but everyone says that’s normal. And once everything fully healed, he sounded so much better than how he sounded pre-surgery because he no longer had giant tonsils in the back of his throat. All in all, I’d say his recovery was pretty good. We just kept reassuring him that his throat was getting better and that if it hurt, it meant he needed to take a drink or eat a popsicle. He did get out of bed in the middle of the night every other night for two weeks post-op. He’d come into our room and wake me. Nothing was ever wrong, he really just wanted to be comforted and put back into bed. I can’t stress enough how important it is to stay on top the medications. This meant giving Owen his meds every 3 hours, round-the-clock. 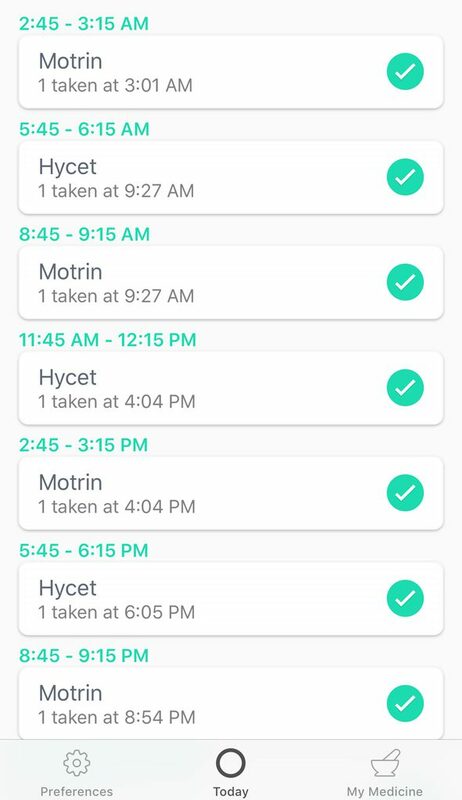 I was able to keep the medication schedule organized by using an app. The specific one I used is called Round. The app would alert me when his meds were due. But I also set alarms in my phone, especially for the 3AM and 6AM times. We kept his medications organized in a bin in the kitchen. 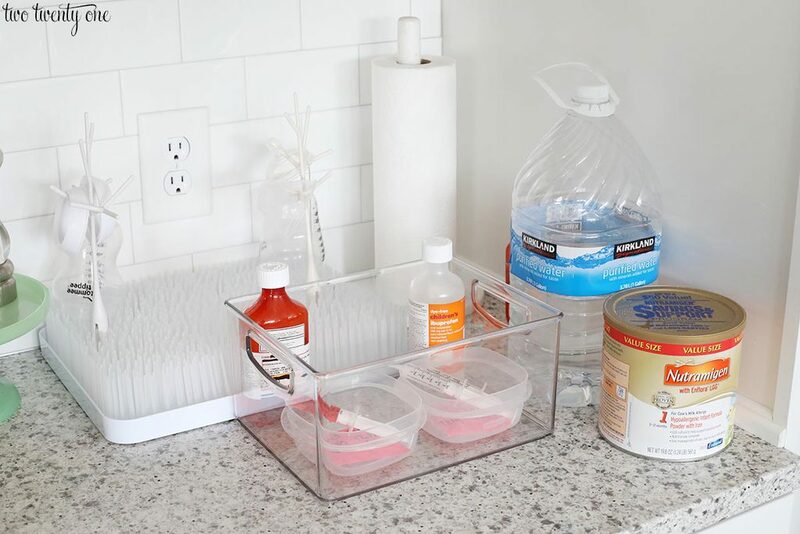 Since he alternated between Hycet and Motrin/ibuprofen, I put two smaller plastic containers inside the bin– one for each medication. 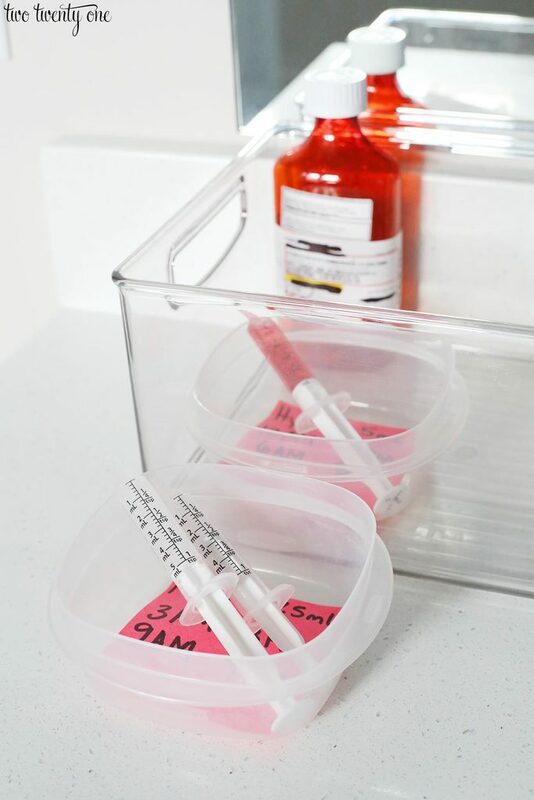 I placed post-in notes inside each container with the name of the medication, the dosage, and the times he was supposed to receive the medication. Because he was receiving his medications around the clock for the first week or so, we’d take the bin up to our master bathroom at night. 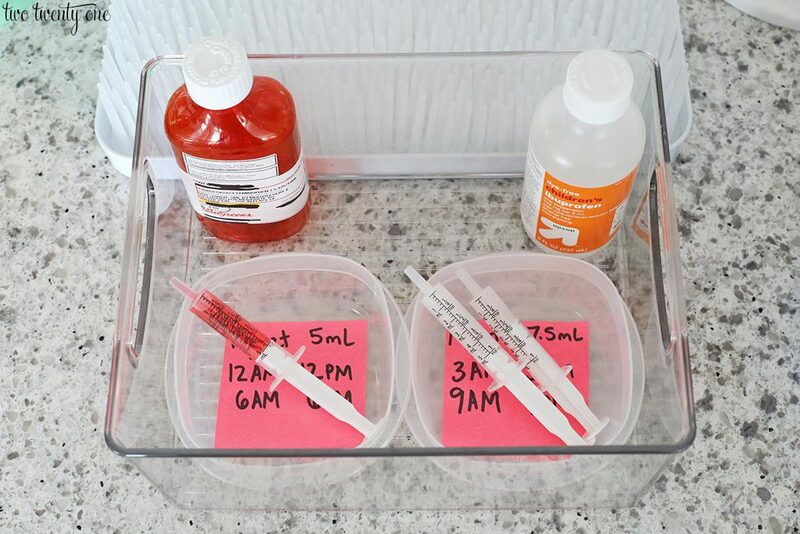 Since one of us would be getting up at 3AM and 6AM in a tired stupor, I would prepare the medications, and then set the next medication outside of the bin so whoever was administering the medication knew that was the meds to give. After giving Owen his medication (he slept through the 12AM, 3AM, and 6AM meds), we’d put the next medication outside of the bin. I’d also run the syringes under water to clean off any excess medication on the outside of the syringe to reduce stickiness. And then, I’d arrange the syringes facing upward in the containers so none of the medication could leak out. In the morning, we’d take the bin back downstairs to the kitchen. After a tonsillectomy and adenoidectomy, eating isn’t as important as drinking. Our ENT emphasized hydration because that keeps the scabs in the back of the throat from drying out and pulling. 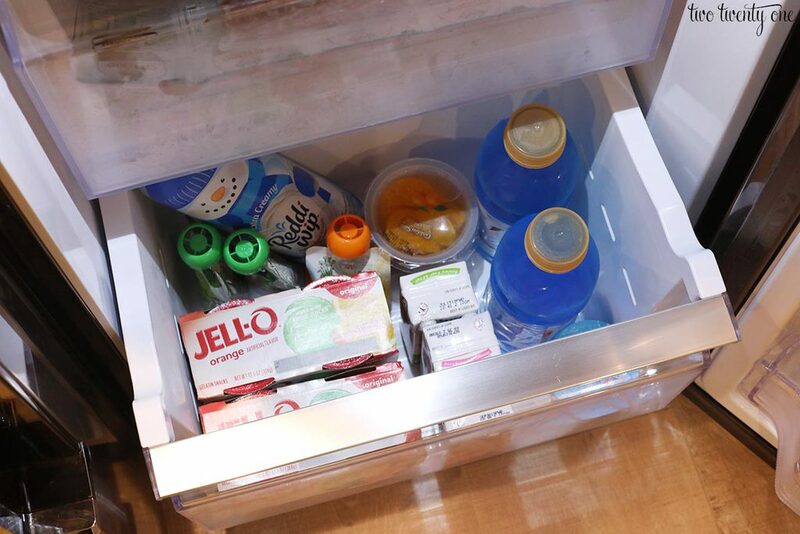 I cleared out the bottom drawer in the bottom section of our refrigerator and made a post-tonsillectomy and adenoidectomy drawer for Owen. This made it clear to everyone that Owen could eat those foods. The ENT said that Owen’s regular foods were fine, just nothing that’s crunchy like pretzels, crackers, or tortilla chips. We made him PBJs (one of his regular staples), but I cut back on the amount of peanut butter so it’d be easier to chew and swallow. I also purchased Jell-O, pudding, applesauce (I kept it in the fridge so it’d be cold), Greek yogurt (our ENT is okay with kids eating dairy post-surgery), ice cream, and rainbow sherbet. I bought popsicles, apple juice, and juiceboxes (these are treats for Owen in our day-to-day life), and Gatorade. I read that it’s best to stay away from acidic drinks post-tonsillectomy. Owen drank a lot of smoothies. 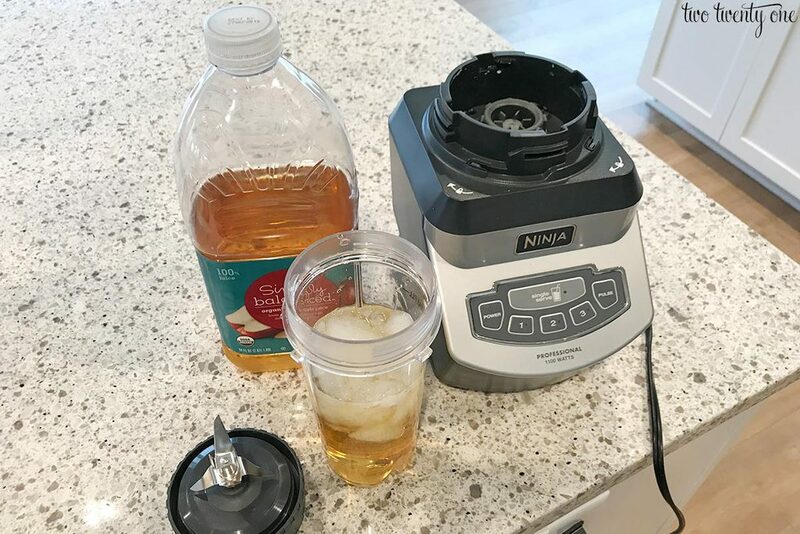 My usual recipe is: one Greek yogurt, 6-8 blueberries, 2-3 strawberries, 1/4 avocado, 4-5 ice cubes, and a splash of apple juice, which I blended until smooth in my Ninja. I’d pour the smoothie into a special lidded cup with a straw, like this, but this cup and this cup would be good too. (Since I was using a non-insulated cup, I’d put the cup inside a koozie when Owen started saying it was too cold to hold.) 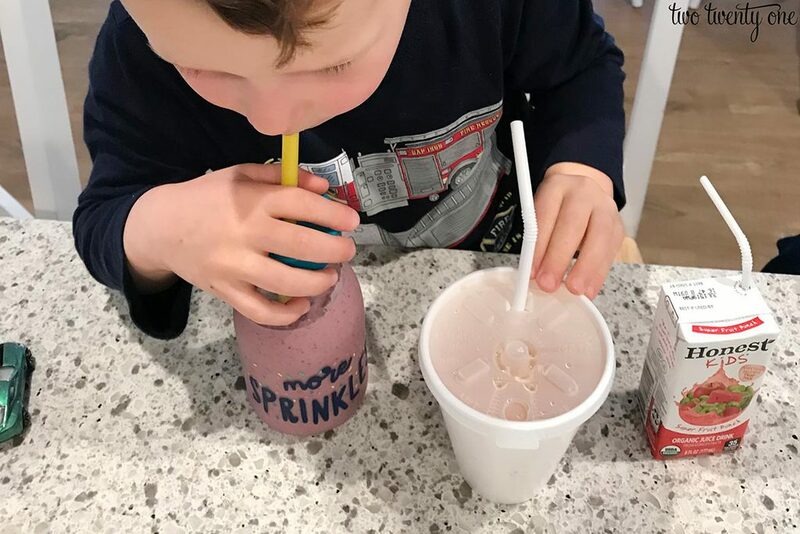 I recommend getting one or two cups and calling them “special cups” or something along those lines so your kiddo feels extra cool drinking out of it. Just make sure the reusable straw is big enough for a smoothie to travel through. I also made a lot of apple juice slushies. Nothing fancy, just ice and apple juice. He loved these (and still requests them). It was the easiest way to get him to drink a good amount of fluids. Just remember to stay away from acidic juices. Before the tonsillectomy Owen had been completely potty trained. It had taken him a while to nail down going #2 on the potty but we’d been success for a few months. I didn’t think about the medications and how one of the side effects is constipation. So we had a few days of regression in that department. We just rode it out and added in some prune-apple juice, which helped immensely. 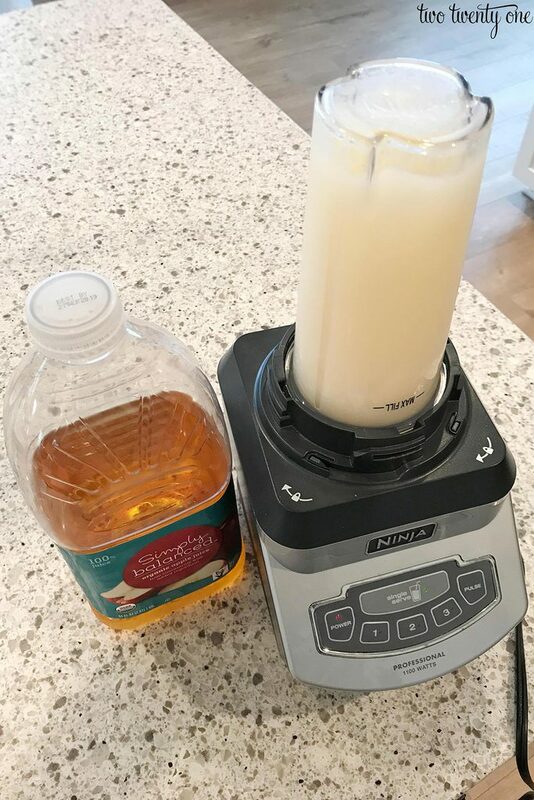 I always have these single serving juices on hand. I like them because I can use them as needed instead of opening a large juice and ultimately wasting it. Owen healed very well from the surgery and is doing great. I think he’s only had one cold since the surgery, and it didn’t result in an ear infection. Maybe it’s luck, but I think that’s pretty good considering he had 3-4 colds over the summer and his surgery was at the start of cold/flu season. He no longer snores, and I haven’t observed him pulling air into his lungs like he used to. So so glad this went well! This post will help so many – I wish it existed when my son had the same procedure. Thank you SO much for writing this post! My 4 year old son is having his tonsils and adenoids removed next week. His tonsils are 3+ as well and he has had the same issues as your son. I now have some helpful tips for pre and post surgery!!! Perfect timing. My cousin’s son is having his tonsils and adnoids out in 2 days. Hopefully this will help, especially with the recovery part. Thank you! This was eye opening for me. I had eye surgeries twice before I was 4 and I’m sure my mother took me to the hospital, got me admitted (this was the days when you went in the day before and come home a day or two after the surgery) , stayed till the end of visiting hours and left. I would nave seen her again until the evening of my surgery. I do remember that our regular family physician was the anesthetist.. and all the white gowned and masked people in the operating room. When my son and daughter (ages 5 & 3 respectively) needed T & A, I took them the day before and after admission, I stayed with them till suppertime, after we’d explored the playroom. I did leave them each a surprise under their pillows when I left I again didn’t seem them till the evening after their surgeries. They were quite content to stay in hospital when I left that time too. I’d told them that their doctor would fix their throats and ears while they had a nap and that the nurses would take good care of them. (I turns out much better than mommy – I have a rep as a terrible nurse). And I don’t really remember giving them pain killers although I must have. So all the advance prep done now seems so much fuss to me. I told my kids what would happen. It would be a little scary but that they were big enough to handle it without mommy. I guess that seems heartless now. What a helpful post for so many Moms! One of my kiddos has some special medical needs and has had multiple surgeries which he generally handles well. Staying calm about it– in front of your child at least– and being organized afterward are a huge part of these things. You really spelled it out so well! I follow a similar process with the meds but I didn’t know that there was an app like that so I will certainly look into it. Glad that this has been so positive for Owen. My son also had his adenoids removed and it was a huge help for him also.